The world of anime is certainly not for everyone, but for those who appreciate this often underrated art form 2013 was a wild year. Studio Ghibli, which is pretty much the Disney of the anime world, said goodbye to filmmaker Hayao Miyazaki following the release of his wonderful (and gorgeous) final feature, The Wind Rises. Now, just months after his retirement, Miyazaki is being honored by the longest-running animated sitcom in the history of television and UTG has your first look at the goods. Airing this Sunday, January 12, The Simpsons will pay tribute to the entire career of Hayao Miyazaki with a short dream sequence in their latest episode. The scene finds Homer and a new acquaintance stumbling through the streets after a bit too much wine, and as their inebriation begins to take hold the world around them transforms into something far more whimsical than your typical evening in Springfield. The Wind Rises is referenced, yes, but so is Spirited Away and My Neighbor Totoro. You can view the clip, in full, at the end of this post. Just to clear up any confusion, the episode of The Simpsons airing this week is not specifically about anime. The plot actually hints at a possible marriage ceremony for Comic Book Guy, but at this time it’s impossible to know whether or not that will be what actually occurs when the show airs. 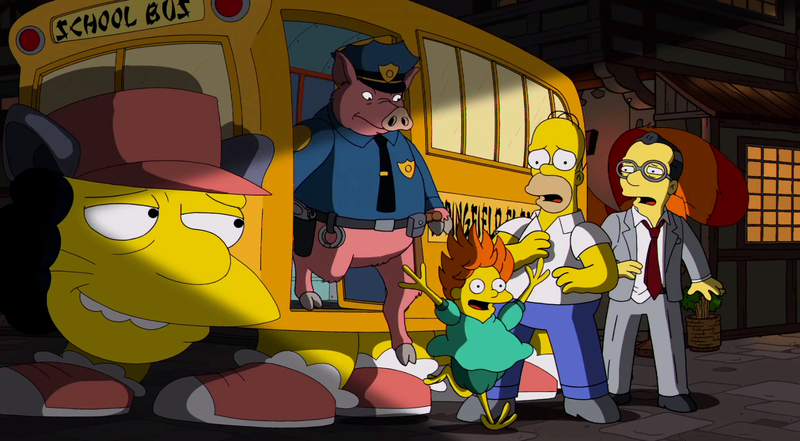 Will you be watching The Simpsons this Sunday? Comment below and let us know your thoughts. According to Simpsons Tapped Out, they’ll be introducing a new character named Kumiko, a sad Japanese tourist. My guess, she’s Comic Book Guy’s bride. Also, Howl’s Moving Castle, Ponyo, and Kiki’s Delivery Service.